Security forces have restricted access to both Tawu and the Nyitso monastery following the self-immolation of Tibetan monk Tsewang Norbu. The second example of such an act in the past six months, the event is testament to the growing frustration of Chinese policies of socio-political and cultural opression. Local Tibetan and exile sources said security forces have converged on Nyitso monastery in a Tibetan region of southwestern Sichuan province following the self-immolation death of a 29-year-old Tibetan monk. They said military and police had surrounded the monastery, in Tawu (in Chinese, Daofu) county, Kardze (in Chinese, Ganzi) prefecture following the incident. On Monday [15 August 2011], Tsewang Norbu handed out leaflets calling for human rights for Tibetans and the return of the Dalai Lama, before setting fire to himself outside the county government buildings. "The soldiers have surrounded the monastery," said a monk who answered the phone at Nyitso monastery on Tuesday [16 August 2011]. "There aren't any inside the monastery, though." Asked to confirm if there were 1,000 troops present, a figure cited by exile sources, the monk said: "Probably there are that many." But he added: "We don't know what is going on outside. We can get in touch with some people by phone, but we really don't know what's going on out there." "We are holding our prayers and teaching sessions [as usual]," the monk said. Local residents confirmed the reports of a military lockdown at Nyitso. "[Nyitso monastery] has been closed off," said a Tibetan resident of Tawu. "They have surrounded it." But she declined to comment further. "If you want to know more you can come here yourself." Woeser, a Nyitso monk currently in exile in India, said the troops had moved in after large numbers of local Tibetans converged on the monastery following Tsewang Norbu's death on Monday. Their aim seemed to be to prevent the Tibetans from getting inside the monastery, and they had placed a heavy guard around it ever since, he said. He said at least one monk from Nyitso named Gyaltsen had been taken away by police, citing local eyewitness reports. "After they took that monk away, they beat him up really badly, till he was covered in blood," the exile monk said. He was very severely beaten, and he had blood all over his face." He said troops were currently guarding the two main bridges on the road between Tawu and the Tibetan capital, Lhasa. "They aren't allowing any Tibetans to travel to Lhasa," he added. An officer who answered the phone at the Tawu police department said he knew nothing of the incident. And an employee who answered the phone at the Tawu county government referred all enquiries to the government propaganda office. However, repeated calls to the propaganda office went unanswered during office hours Tuesday. "This terrible incident underscores the urgent need for the Chinese government to engage the Dalai Lama on the question of Tibet's future so that other Tibetans like Tsewang Norbu who are so frustrated with the repressive policies in Tibet can hope for a just solution," said Mary Beth Markey, President of the International Campaign for Tibet. Tsewang Norbu's self-immolation was the second such case reported this year. In March, Phuntsog, a monk at the Kirti monastery in Ngaba prefecture, set fire to himself in protest at rule by Beijing, leading to a security crackdown by Chinese forces and the forced removal of about 300 monks from the monastery. The London-based Free Tibet rights group has expressed concern that the same crackdown will take place in Tawu. 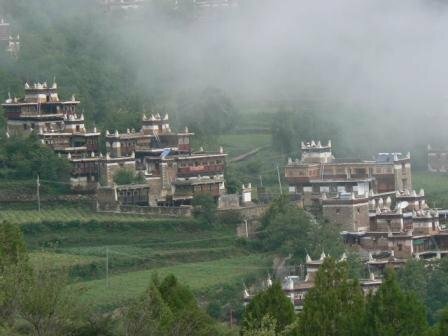 “Following Phuntsog’s death, the Chinese regime deployed troops onto the streets of Ngaba, forcibly removed hundreds of monks, imposed curfews, undertook house searches, and set up military roadblocks around the town which remain six months later," Free Tibet director Stephanie Brigden said in a statement. "We have grave concerns over what could unfold in Tawu," she said on Monday [15 August 2011], adding that telephone lines have been cut and Internet cafes closed in an effort to control news spreading across Tibet and the outside world.